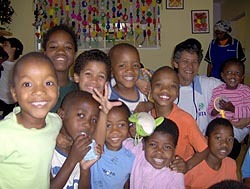 What a privilege it is for us to share the latest news about Masigcine Children’s Home with you. We hope you will enjoy reading about what has happened in the last few months. The Children have enjoyed four parties during this period. The first one was with Radio Tygerberg where they each received a Christmas present and had a wonderful day of entertainment at Bellville High School which included an entertaining circus show, jumping castles, Father Christmas who arrived on a fire engine, parachutes landing on the field and lots to eat. The second party was organised by Ali from Colliers International Property Managers. They arranged for transport for the children and staff and treated them to a day of fun, entertainment, gifts and lots to eat and drink. Ali phoned me after the event to tell me how well behaved the Masigcine children were - thank you to our dedicated and loving staff that take such good care of these young ones. The youth from the Church of Christ congregation in the community came and spent time with the children. They brought a jumping castle and served braai chicken and sausage with salad. The children had a whale of a time despite the heat of the day. Thank you to the volunteers who assisted at the Home on Saturday - your support and dedication is so appreciated. Some of the staff from SITA (State Information Technology Agency (Pty) Ltd) came and visited Masigcine. It was a lovely time for both the children and the visitors alike. The children were treated to party packs with interesting goodies inside, which they ate to their hearts content! They have committed to get involved on a more long term basis. On a very hot Saturday morning some of the staff from Pathcare came to the Home bearing Christmas gifts for the children. They were enlightened to the recent Home make-over at the Home and committed to getting more involved as volunteers who live in the area. Safmarine under the leadership and guidance of Annemi Brand and her colleagues entertained the children on a hot Saturday summers morning in Mfuleni. They came equipped with face painting, balloons, jumping castle, lunch, a fantastic magician show and Father Christmas who handed out gifts to each child individually. It is so encouraging that the youth of our country have the heart for those less fortunate than themselves. A group of students from the University of the Western Cape came through one morning during the week prior to Christmas and spent quality time with the children. Our sincere thanks to each and every person who gave up their precious time to make a difference in the lives of the children at Masigcine Children’s Home and on their behalf we would like to thank you dearly. As you have sown, so may you reap. We would like to thank Legal Aid for their wonderful gifts of a brand new kettle plus a brand new microwave oven, which was opportune since the one at the Home was in need of replacing. Thank you so much for your support. Huggies also generously donated a large consignment of disposable nappies, which was a relief to the monthly shopping bill. 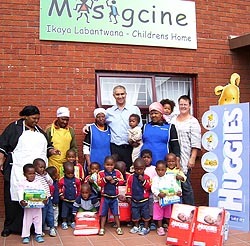 Thank you to Belinda and Bernard from Huggies for organizing this - we are very grateful. Atlas Fire Security has also supported us with a financial donation of R6000.00. Thank you very much for your contribution. Please be assured that your gift will be used wisely. 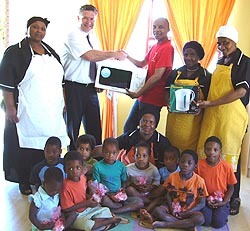 When SITA came to visit the children, they brought with them a supply of food, nappies and a cheque for R5000.00. Thank you to the management and staff at SITA for your generous donation and for the wonderful morning that you spent with us at Masigcine. Michelle is one of our dedicated volunteers who visits the Children’s Home most Saturday mornings. She is a blessing and a true ambassador for God. Her family Andy, Ann, Beth, Pat & Chris who live in the UK made a financial donation towards Christmas decorations for the Home. Your contribution made the Home very pretty during the festive season! Thank you! We trust you enjoyed Michelle’s visit over the Christmas season. The children and staff (and us) missed her dearly! Melody from EduCare brought the children 10 brand new black scooter (3-wheelers) for them to race around on. The few that were in use before we received this gift were in a bad state and you can imagine 20 odd kids all wanting to ride! Lisa who represents a group of people in the Strand / Somerset West area started an initiative by purchasing brand new pyjamas for each child. A gift of this nature may seem underestimated but we have seen the joy on the children’s faces as they are able to identify their VERY own pretty, new pyjamas. The girls look so cute in their pink and soft colour wear and the boys are so proud to have Spiderman on their chests! We really trust from meeting you that we will have a long term relationship. Thank you Lisa – please convey our thanks to the rest of your team and please encourage them to come and visit to see what impact they have made. Seven of our young boys are ready to attend school for the first time. This is a whole new chapter that is unfolding in their young lives! Five of them are on the waiting list until such time that we can acquire a copy of their birth certificates. This matter is receiving our top priority. We needed to get them all kitted out with new school uniforms (grey trousers, white shirts, grey socks, and black shoes) and Pick ‘n Pay surprised us by giving us a shopping voucher which should adequately cover all these needs. Thank you so much Suzanne Ackermann and your team! What a pleasure it is to deal with this company! Jonathan Erasmus, our oldest child at Masigcine has passed to Grade 3 - we are very proud of him. We are most grateful to Dr Louise Lindenberg, Dr. Wayne Kretchmer, Dr. Mariette Groenewald and Dr. Tertius Christie who have offered their services on a pro bono basis to attend to the health needs of the children at Masigcine. During a recent medical check up, the doctors reported that they found the children to be well nourished. This is all due to them receiving an improved balanced diet each day with more milk, fresh fruit and protein. Young Ricardo broke his arm a couple of months ago. We took him back to Tygerberg Hospital to have the pins removed (they could only remove one of them, the other will need to be taken out under general anaesthetic which is scheduled for mid-January 2008), which was a long day for this little man but he was so good and didn’t complain once. The child illness, chicken pox has just done its rounds at the Home but the children have all recovered well. We would like to convey our thanks to both Dr. Lindenberg who called on the Home to assess the situation and to the staff at Masigcine for the way that they care for these children - it shows! We believe that by equipping, motivating and empowering our staff at Masigcine they will see that we value them and at the same time realize what an important role they are playing and what impact they are making in the future of these children. We are looking for more volunteer to join our ranks to lighten the load for the staff at crunch times such as meals times; bath times and structured activity times. age will be to their advantage. Help with the administering of medicine and general first aid and nursing care. We would like to thank the volunteers who supported us by wrapping Christmas gifts at Pick 'n Pay Family Store in Kuilsriver. This service was offered from the 21st – 24th December to the Pick ‘n Pay shoppers for a small donation in aid of the Masigcine Children's Home. Thank you VERY much! A special word of thanks also goes to Craig and Glen who are the Managers of this store for taking the initiative in this regard. Pick ‘n Pay Family Store in Kuilsriver has also had a Quad Bike up for raffle & a SMS competition running for the past three months. We are extremely grateful to Pick 'n Pay Family Store in Kuilsriver for their dedication to Masigcine.